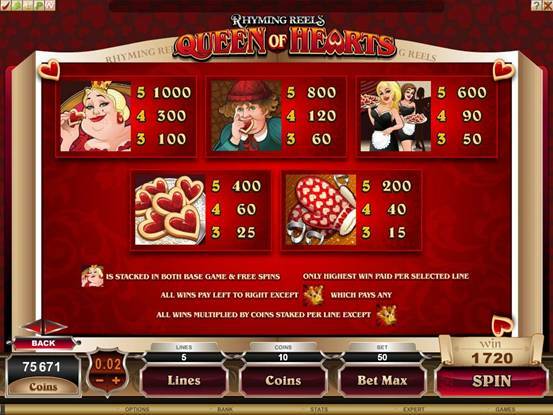 Hold on to your Head when playing Rhyming Reels - Queen of Hearts as the famous corpulent monarch prevails in this video slot. The ‘Queen of Hearts’ symbol is Wild and doubles all wins when substituting. Keep an eye out for it during Free Spins, because it appears stacked! 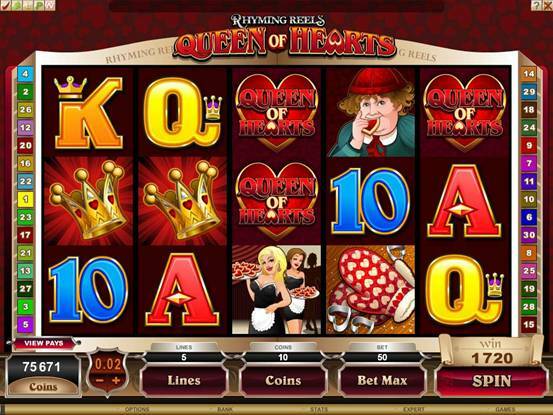 But also look out for the Queen of Hearts herself as she is stacked inside of the base game and Free Spins! 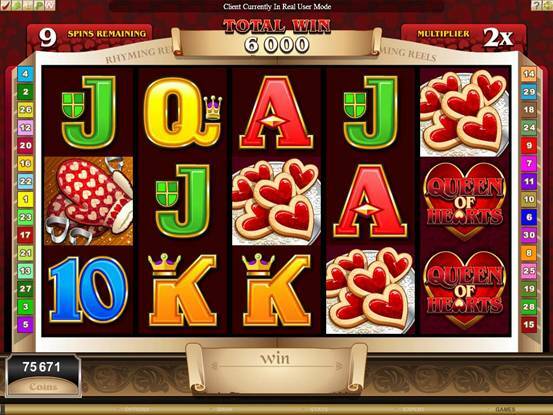 3, 4 or 5 scatters will trigger 10 Free Spins whereby all wins are doubled! 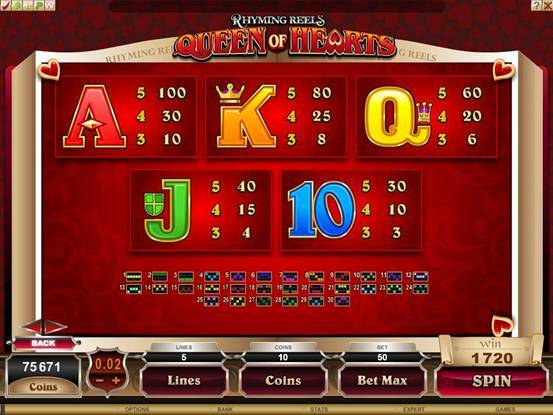 An old rhyming poem that dates back to 1782 informs the theme for Royal Vegas Casino latest new 5 reel, 30 pay-line video slot in the Rhyming Reels series - QUEEN OF HEARTS. The ancient couplet tells the story of a crook who one summer stole tarts newly baked by the Queen, provoking the king's anger and tough physical retribution. This brought about the return of the tarts and a new direction in life for the knave! All of these characters, from the rather corpulent queen to the chubby knave and a bevy of bootylicious serving maids, are captured in the bright artwork graphics that set the theme. The king's golden crown heralds the approach of good Free Spin news on this slot; when 3, 4 or 5 appear it launches 10 retriggering spins with a 2x multiplier and achievable rewards of up to 2.4 million coins. Another member of royalty that players will welcome is the plump queen herself - this symbol is stacked within the base game and free spins action. 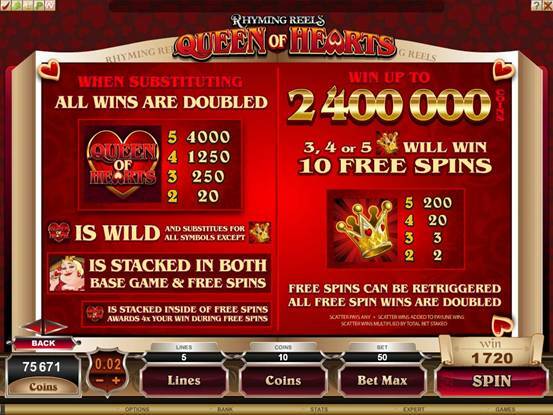 The game's Queen of Hearts logo is Wild, enabling stacked winning combinations to be built in free spins and at the same time rewarding players with a win-doubling multiplier of its own. The 0.01 to 0.05 betting range, at 10 coins per line, gives players the potential for hours of entertainment on a game that really is fun to play and offers solid potential for rewards. On the base game achievable rewards are 15 000.00, which can shoot up to 120 000.00 on Free Spins. vowed he'd steal no more! Golden Tiger Casino Play Queen of Hearts Internet Slot with $1500 totally free. State-of-the-art gaming software is the most advanced in the industry - the realistic graphics, exciting sound effects and smooth gameplay are truly unbelievable! The wide betting ranges make our casino games accessible to everyone from the novice right through to the experienced gambler.